Lauren Loves to Eat: Portland, Maine: Corned Beef Hash at Hot Suppa! 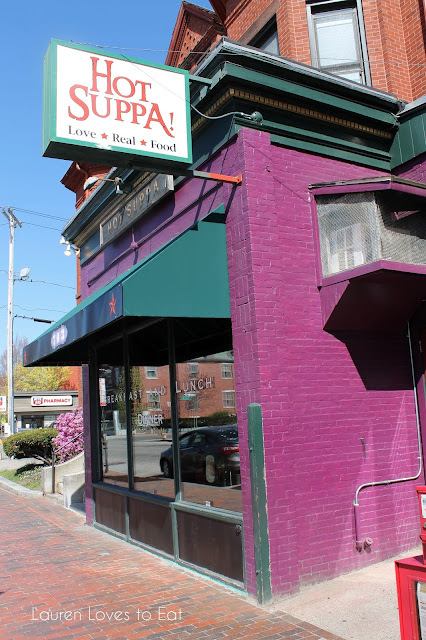 Portland, Maine: Corned Beef Hash at Hot Suppa! The original plan was to visit Hot Suppa! for brunch, but as soon as I planned out all our meals for the weekend, I was faced with a problem of squeezing too many restaurants into not enough days. My co-worker is from Portland, and often goes back for weekend visits, so I showed him the itinerary and asked for advice. He immediately recommended changing Hot Suppa! to a breakfast meal, so that there could be 3 meals instead of 2 for Saturday. But of course. The only sacrifice would be having to get up earlier, and everyone knows that I will very happily choose food over sleep. We got to Hot Suppa! at 9:40am on Saturday morning, and were told it would be a half hour wait. After half an hour passed, the hostess said that there was bar seating available, or we could continue to wait for regular booth or table seats. We opted to wait that extra 15 minutes. There wasn't much to do while waiting. There's a gas station and convenience store across the street, and another restaurant Local 188 a few steps away, but no shops or anything. 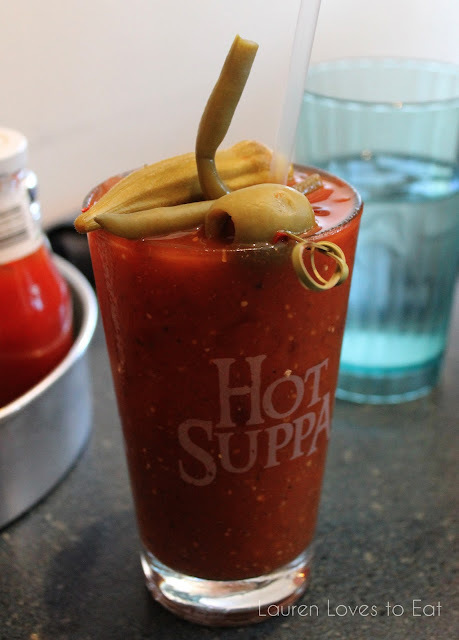 Bloody Mary, $7.99: A superb Bloody Mary complete with green beans, a green pepper, and olive. This was definitely on the spicier side, so I couldn't take more than 2 sips at a time. 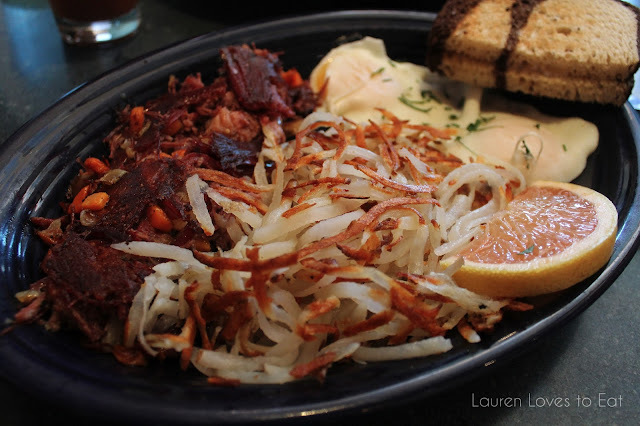 Corned Beef Hash, $10.95; +$1.50 for Hashbrown (or grits): The corned beef hash is made in house with shredded corned beef, carrot, potato, and onions. It's definitely very different from anywhere I've ever ordered this. The combination of textures was great, with more crisp pieces, as well as soft and tender parts. Dry and bland, the hashbrown was disappointing. I kept trying to add egg yolk from my poached eggs onto the potatoes to add some flavor. The slices of rye bread were slathered with more butter than I would ever be okay putting on myself, but the result was very tasty! 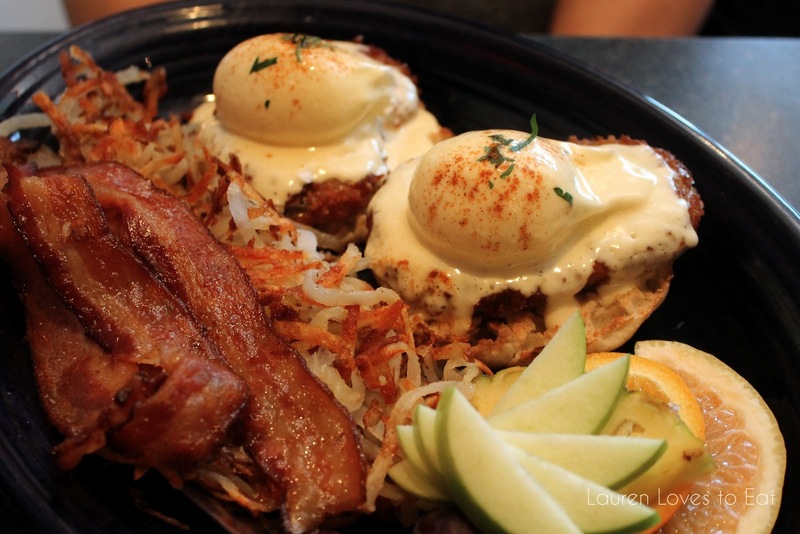 Eggs Benedict, $11.95; Side of Bacon, $3: The eggs benedict comes with fried green tomatoes or bacon on an English muffin. If you opt for both, the side of bacon costs $3. I loved the hollandaise sauce at Hot Suppa! It was creamy, buttery, and wonderful. The bacon on the other hand, was not good. Bacon should always be crispy. This is a rule! If When I return to Portland, I will probably skip this and check out the Spanish/American brunch at Local 188 instead. It has received great reviews, and supposedly has terrific brunch cocktails at only $5 each. 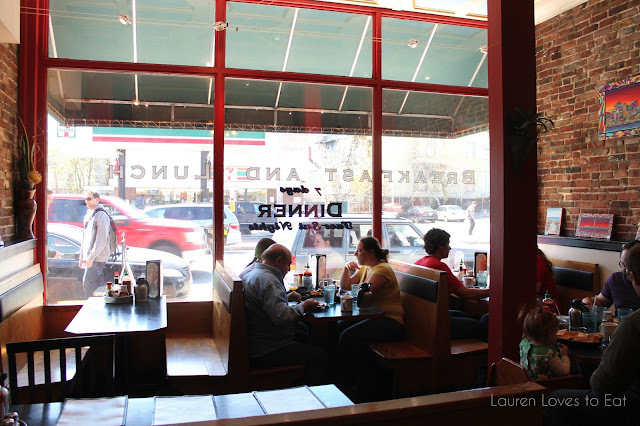 Note that these 2 restaurants are around a mile/15 minute walk from the downtown area. It worked out well for us because we stayed at Holiday Inn which was between the two. the hash browns look sooooooo good, and love the poached eggs too.